This map highlights The Landings’ trails, for your convenience. For an adventure you won't soon forget, try hiking, running, or biking the 2.33 miles of Landings Nature Trail. The Natural Trail is maintained by The Landings Association and offers a delightful trek through the woods beneath a canopy of pine trees. It is not an odd sight to see deer scamper by or hear the flutter of birds overhead as you travel along. Do be careful though, as there have been the occasional snake sighting, but then again, it is nature’s playground! 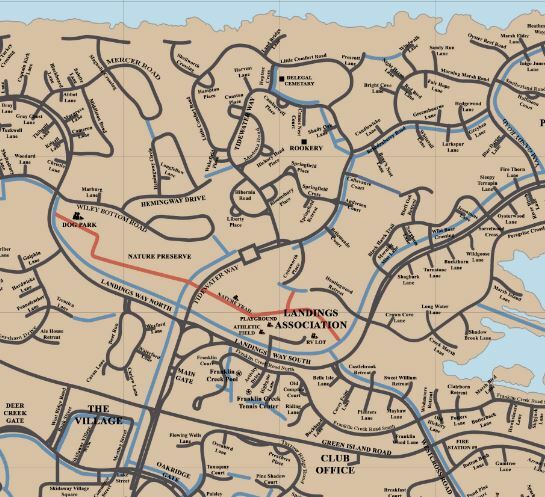 This is a static map showing The Landings’ streets and trails, for your convenience.